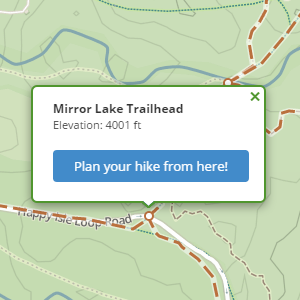 Traillon provides a highly interactive map which allows for planing a hike and view detailed route analysis. Check out how it works below. Choose the starting point from a considerable number of waypoints to begin planning your hike. 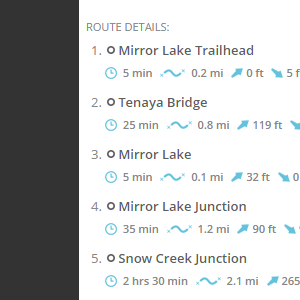 Click on pulsing waypoints to build up your route step by step. 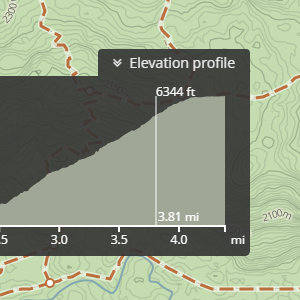 Check distance, approximate hiking time, elevation change of the whole route and between adjacent waypoints. View elevation throughout the length of the route. 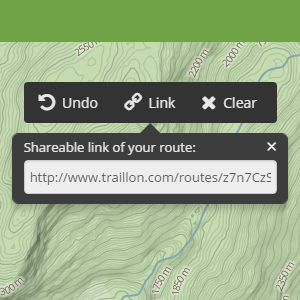 Get a short link to your route and share it with friends. Notice: Use Traillon map at your own risk. The map may contain errors and Traillon.com makes no warranties, although every attempt will be made to ensure the information is accurate. Furthermore, Traillon.com assumes no responsibility or liability whatsoever associated with the use or misuse of this data.